Well the DSLR video capabilities finally proved itself of value. I was looking for but not necessarily seeing it. 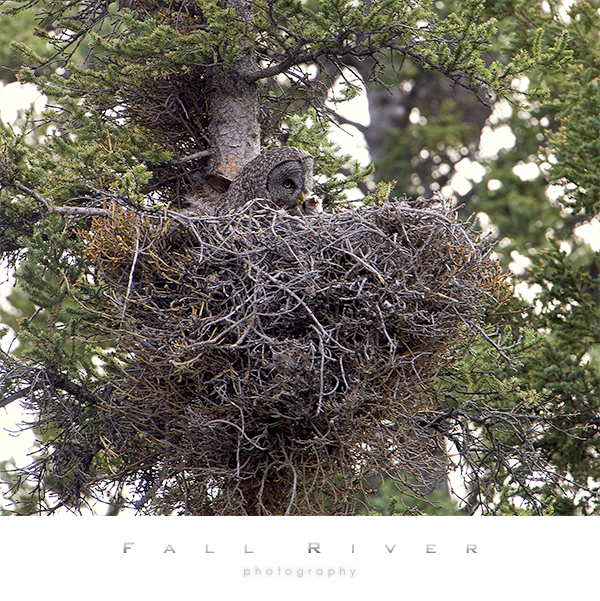 We were out making photographs of a Great Gray Owl pair on the nest with chick and we had been working this project all morning. It was getting late in the morning and the light was definitely getting harsh so it was just about wrap up time when the female started hooting up a storm on the nest. We had not yet seen the male that day but I had feeling and so did Dee. We knew something was up and I got on point with my rig and Dee instinctively hit the RECORD button on her camera. The resulting video is awesome. The male flies in and hands off a vole and then turns around and flies out and then the female serves up the meal to the little chick. The chick was only a week old at the time but you can see him going right at it. He was definitely hungry. All I can say is Wow, what an experience. This one is really special though because I got to see it, I get to keep seeing it, and now I get to share the experience in motion with you. Times…. they are a chang’n. Enjoy and thanks for watching Fall River Photography TV :-).